Rorstrand Fleur de Lis LARGE Platter with the 3 Crown Pottery Mark:- This is the favorite of all my plates. 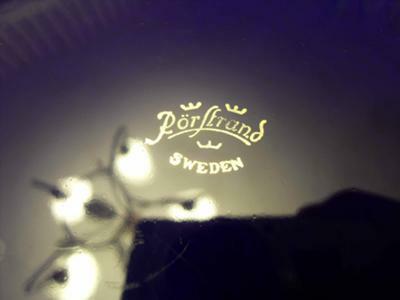 It is a Rorstrand from Sweden (not much mystery there), but despite its Swedish origin, it features a fleur de lis pattern, which I had always associated with France, not Scandinavia. The color is deep and dark, and the glaze is perfect. You can tell when you see it is person that it a quality piece. Because of the glaze, I was unable to get a decent picture of the front. Without a lot of light, the plate just looks black, but when you use enough light, much of it bounces back into the camera. Well, I'm sure someone could take a good picture of this, but I'm not him. 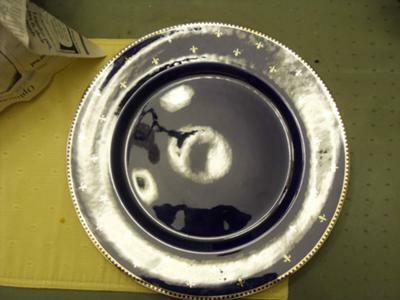 I am mostly curious to know how old of a plate this was, and if there is a whole line of pieces with this pattern. It might be fun to collect a whole place setting of this, but if the demitasse cup is any indication, it also might be disheartening. I am happy to be educated about Rorstrand of Sweden, because I was not really familiar with them at all and we have not talked about them on this site before. This is terrible oversight for such and important European porcelain company. This is why I have taken some time and care in my reply to you. Many thanks for an interesting submission. in the Stockholm region of Sweden. They made faience, majolica and fine feldpar porcelains. According to some online sources the three crown mark has been used since 1884. However, I checked every Rorstrand in my Kovels encyclopeadia (about a dozen in all) and the first mark shown resembling yours was from the 1940's. Your mark was merely catalogued as the 'current' mark. It seems Rorstrand don't change their marks so often, so 'current' means this could go back many years, but my books don't show exaclty when this current mark began. The current 3 crown mark was slightly different in the 1940's version in that it didn't have "Sweden" written on it. The 'R' was also slightly different with an extra line at the top. So all I can say is your mark is still the current one in use, but is more recent than the 1940's. Rorstrand as a brand are still going having been bought out by the Hackman Group from Finland in the 1990's and recently aquired by Fiskars of Sweden. For me, ther is always a certain solid quality about Scandinavian porcelain and pottery. It is hard to describe, but I know it whan I see it. The design values are always first class and there is always a quality edge. I have never seen such a wide range of auction pricing for one company as I have for Rorstrand. The prices attained were ranging from $2.00 for blue & white chriastmas plate, to many thousands for certain of their art pottery vases and porcelian dolls. On average, art vases seemed to fetch many hundreds, whist as set of 6 porcelain plates only went for $35. This seems to me a good place for a clever collector to be. Bargains and very nice items are to be had for a snip - then sold on for more money! You can do a bit more research in this area and also finding other items in your set by reading some specific pages on this site. Start by going here Researching the identity and value of antique and vintage fine china and then follow the links off this page, for example to the 'how to save a search on ebay' page. Also, if you have a piece with this pottery mark let us know what you have - it all adds to the knowledge base.